Are you of the same opinion as many Outlook users that Lotus Notes is somewhat better than Outlook in certain aspects? Owing to this benefit bag of Lotus Notes, are you inclined to change your email client from Outlook to Notes? Is Outlook to Lotus Notes conversion on your mind now? Are you searching some tool for migrating from Outlook to Lotus Notes? After the decision to change email client from Outlook to Notes, there comes the need to convert email data from Outlook PST files to Lotus Notes NSF files so as to keep viewing old PST email data in Notes as well.For that matter, investing in a third-party Outlook to Lotus Notes conversion tool comes as an easy and safe option. In fact, it can be called one of the most feasible options to convert Outlook to Notes. 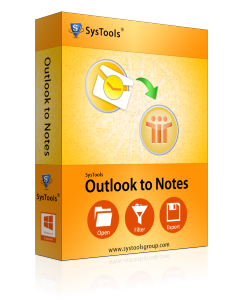 SysTools Outlook to Notes software is a potent tool for this purpose. You can also use this software to export contacts from Outlook to Lotus Notes, as it is a comprehensive solution to convert all the mailbox items. So, you can easily use the software to convert Outlook to Notes contacts also. The above advantage set of Lotus Notes appears it to be somewhat better option to many Outlook users. You also might be thinking on same lines, which is quite justified taking into view the aforesaid benefits of using Notes email client.